Rest Assured is one of the most popular libraries which is highly used in API Test Automation in most of the companies. In this Rest Assured tutorial, I will try to explain Rest API, API Testing, API Automation, REST, and SOAP protocols. 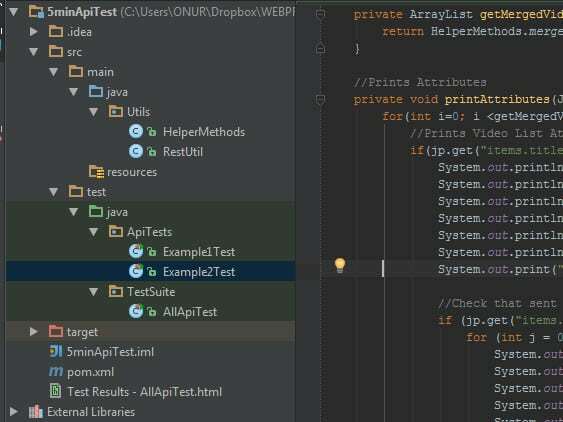 In this post, I will explain what is API and API testing, what is the difference between SOAP and REST services, and how to test REST APIs with Rest Assured Library. API stands for Application Programming Interface. It comprises of a set of functions that can be accessed and executed by another software system. Thus, it serves as an interface between different software systems and establishes their interaction and data exchange. Ideally, these three layers (tiers) should not know anything about the platform, technology, and structure of each other. We can test UI with GUI testing tools and we can test logic tier (API) with API testing tools. Logic tier comprises of all of the business logic and it has more complexity than the other tiers and the test executed on this tier is called as API Testing. API testing tests logic tier directly and checks expected functionality, reliability, performance, and security. In the agile development world, requirements are changing during short release cycles frequently and GUI tests are more difficult to maintain according to those changes. Thus, API testing becomes critical to test application logic. In GUI testing we send inputs via keyboard texts, button clicks, drop-down boxes, etc., on the other hand in API testing we send requests (method calls) to the API and get output (responses). These APIs are generally REST APIs or SOAP web services with JSON or XML message payloads being sent over HTTP, HTTPS, JMS, and MQ. I don’t want to go into theory so much in this post. If you want to learn more theory on API testing, you can visit below websites. In order to test REST APIs, I found REST Assured library so useful. It is developed by JayWay Company and it is a really powerful catalyzer for automated testing of REST-services. REST-assured provides a lot of nice features, such as DSL-like syntax, XPath-Validation, Specification Reuse, easy file uploads and with those features we will handle automated API testing much easier. Rest Assured has a gherkin type syntax which is shown in below code. If you are a fan of BDD (Behavior Driven Development), I believe that you will love this kind of syntax. Also, you can get JSON response as a string and send it to the JsonPath class and use its methods to write more structured tests. I generally prefer JsonPath for more structured tests. How to Make a POST Request with RestAssured? The following code uses requestSpecBuilder to make a post request. Parameter descriptions are listed below. setContentType() – Pass the “application/json”, “application/xml” or “text/html” etc. headers to setContenType() method. For more theory, please visit references. I want to go with an example questions and their solutions. Test Description: Test a search with a search term and number of 4 videos parameter. Expected Result: We will receive details of the URL to the video and associated title and description in JSON format. Verify the HTTP response status returned. Test Description: Test a search with an id of video and number of 4 related videos parameter. Expected Result: We will receive details of that video and 4 related videos including their title, URL and associated image in JSON format. First, it is very reasonable to use a framework/library which provides us testing an API easily in a short period of time and we chose the Rest-assured library. It is better to write the code with below rules. – Each test has a single responsibility and includes a single assertion. – Explicit separation has advantages while we are doing black-box testing. – The logic of a test should be written in a high-level way. – All details such as sending request, creating request, dealing with IO should be done via utility methods not to do with inline methods. Write the class, methods etc. that can be re-used for the testing of other endpoints of API. Add documentation, comments which describe the tests sufficiently. You can format JSON responses with notepad++’s JSON Viewer plugin. 1) I wrote HelperMethods class and RestUtil classes for reusability and clean project structure. – HelperMethods class comprises of test-related functions. – RestUtil class contains Rest Assured related methods. 2) Example1Test and Example2Test contain our tests and assertions. 3) AllApiTest is the test runner suite. We can run all the test with the AllApiTest test suit. In this project, I used Maven and pom.xml is our dependency and profile xml file. We will also go into details of this file further. Now we can start to examine the test code. We start with pom.xml. 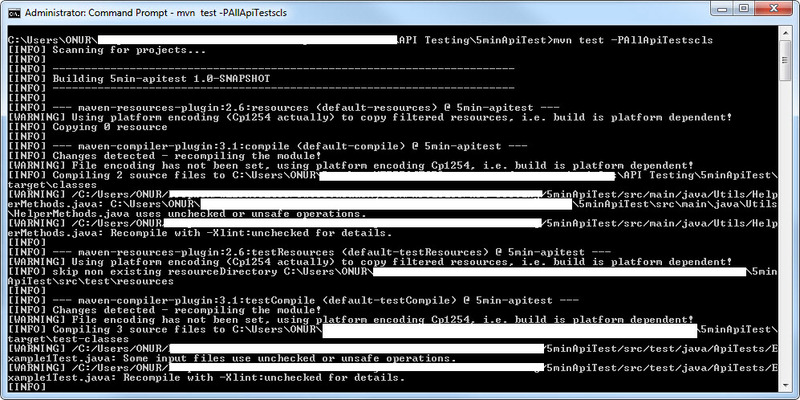 – For running the test from command prompt with maven I also added AllApiTests profile at the end of the pom.xml. We can run all tests with “mvn test –PallApiTests” command. I tried to explain the other codes line by line. Now I want to go on with project’s JAVA files. It is a utility class for Rest Assured Library. It contains many methods that help us to write our codes more effectively. It is equal to "barack obama/videos.json?num_of_videos=4"
* First convert the API's response to String type with "asString()" method. It is another utility class for our example1 and example 2. It contains methods about example1 and example2. We created this class for creating clean project structure and prevent code replication. Verify the http response status returned. Check Status Code is 200? all id's under "items" tag. We can use JsonPath's get method like "jp.get("items.related.id");"
It will give us all id's under related tag. I explained the code line by line below. //First, I declared Response and JsonPath objects. Then we will do query and manipulations with JsonPath class’s methods. We can do all of the preparation operations after @Before Junit annotation. //Verify the http response status returned. Check Status Code is 200? I explained the code line by line. //In this example, I assigned full path manually in below code line. It is our test suite. We use this class name to create a profile in pom.xml. Thus, we can run our tests on command prompt by typing below maven command. When you create your project with the files that are described and shared in this post. You should go project directory in command prompt and simply type below command. Then, our tests will run as shown below. 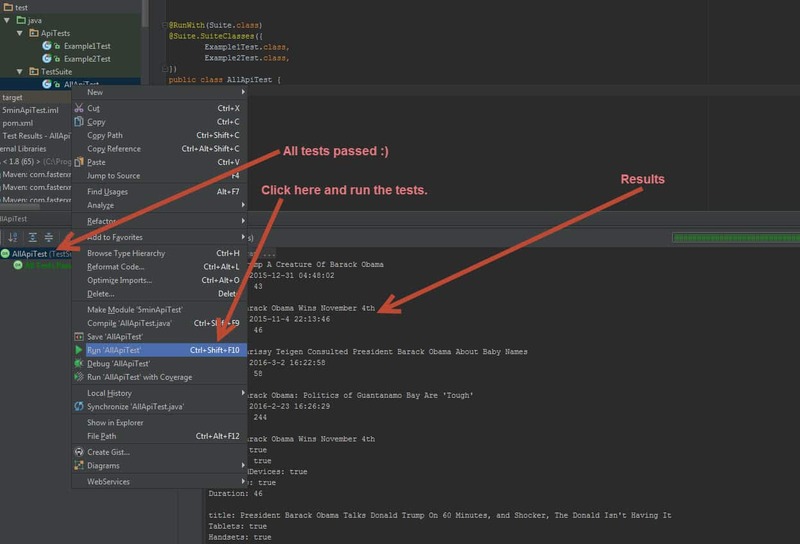 Also, you can run the tests in IntelliJ or Eclipse. Can we use cucumber features to run API test. If so what does the framework involve. Of course you can. I did not do this before but when I googled it, I found below articles. Most of them are using Ruby to do this. You can find a lot of results when you search “api test with cucumber” on google. Good Blog on API testing with Rest-Assured..!!! Do you have any working example that you can illustrate on POST request passing the data dynamically ( read JSON file and pass in test script). I do not have any working example. Now, I am in a vacation. I will also check after vacation. Very helpful article. Thank you for giving such an explanation with relevant examples. It really helped in my project. Can you please give an example how to post a complex Json post body (POST Method) with data provider. the Post body should be constructed with the values from dataprovider. I did a search and found below articles. I hope this helps. Thanks for detailed explanation. We are trying to implement the same. I am getting exception at ‘AfterTest’ method. Please check here and debug your program carefully. I have my test cases written in SOAP UI PRO tool, is there any way that i can migrate those TCs to Rest Assured? I am really happy that you have posted this article . Thank you so much for this article and it really helped me. Thank you. I do not have that example but I found this article for you. https://semaphoreci.com/community/tutorials/testing-rest-endpoints-using-rest-assured Please check “Sending Test JSON Data with POST Calls” section. Hi Onur, I’m thinking of using Rest Assured for my API testing, then I saw RunScope online where you can monitor tests and run tests + implementation of tests are easy. Do you know if Rest Assured is still to prefer or should I go for RunScope? If you want to use open-source solution you can use RestAssured. It is also not hard to use it and it has a significant community. When u get in trouble, you can find many blog articles or StackOverflow questions/answers. But If you want to go faster and much easier tool, you can go with Runscope. If I were you, I would try RestAssured for 2-3 weeks. If I could not reach my goals, then I switch to RunScope. But If you have very limited time and if you need to give a decision quickly, you can go on with RunScope. Hi.. It is a nice post.. I recently tried a new framework ‘Karate’ for REST API automation. They are claiming that it is a really good tool which is lot better than Rest-Assured. I am bit confused in choosing in between these two framework for our API automation.Could you please suggest is Karate really good.Or are there any drawbacks? I haven’t tried Karate but RestAssured is a good library. I am using Version 0.1.9 of Rest Assured for .Net. I wanted to use https for sending the request instead of http. Please could you advice if there is some way to use https as UseHttps() is not working. It is better to write DBOperations Utility class to handle DB related operations. I am having a problem. when validating a schema, if a value returns null, rest assured throw assertion error. how can i fixed it ? Onur thanks for answering. I had been different problem. But i was find correct reason. Json Schema i used was incorrect. 1. Could you please let me can i Connect to Jenkins for CI? I need to run my APi every 10 mins and genrate reports and get email notification if response code is not 200? 2. Does RA supports Database testing? 3. My response content type is “text/xml” i am finidng most of the examples in JSON only. could u please give me some examples on XML, and XML methods?? 4. could u please give Data Driven example on RA from reading or validating from excel sheet? or extracting all url from excel sheet one after one. 1. Yes, you can connect with Jenkins. 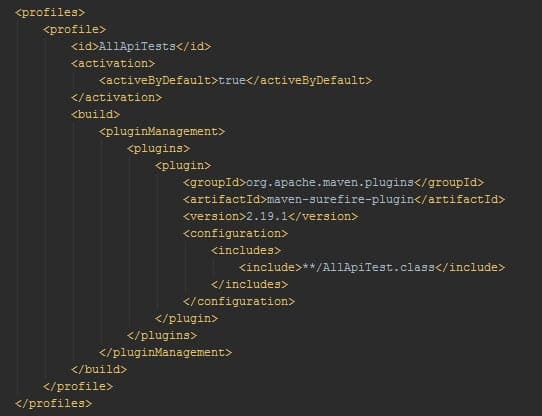 You should use like “mvn test –PallApiTests” command to integrate with Jenkins. Set JDK and Maven settings. Write their paths. Thank you for posting this clean and basic project example. I have a question though, in Example-1.class and Example-2.class you are running the same SetUp() method. Is there any smart way to make both test suites to use same SetUp() function? Hi Gökçe, of course, there is a smart way to combine setup methods. 🙂 One of the most common ways is to write a BaseTest class and then extend it in test classes like Page Object Model. There are some problems in my code. 1- Test classes should have only test methods. 2- It is better to write common setup and teardown methods in BaseTest class. This is a great article on API testing. Also went through your couple of articles and they are very handy. You are welcome! I am happy to hear your comment. Tried to execute above examples, but not executing. Yes, That API is not working. That’s why you are getting a problem. You can learn the tactics from this article and create your own solution. It is a basic Rest-Assured Test with TestNG. – Become a member of Swagger.io. – A sample URL link is given to Swagger and details of the POST & GET methods are displayed. – The detail of the returned JSON Data is structural. – A sample GET method is tested on the browser according to the Swagger output. The results are checked. To avoid repetition of code whenever possible, I wrote the methods that the test methods can use frequently in the TestUtils class and the methods that the API tests use in the APIUtils class. In my tests, I just tried to do the necessary operations. I wrote a BaseTest class to use for all tests. This includes operations to be performed before and after the tests and global variables. So whatever example you showed, that is the way to write tests for REST API? Could you plz help me on this? Which link i can use as URL. could you please tell whats wrong? 2) Click try it out button. 5) Click try it out. 6) type 2 as id. Then you will see the results that you added at first step. geting response in XML. How to get response in JSON in browser? You need to select “Response content type” = application/json in dropdown. using “http://petstore.swagger.io/v2/pet/2” in browser, it showing response in XML. can you please tell me what i have to do remove this error? I don’t understand your exact problem. Maybe it is a connection problem? Rest Assured or Soap Ui which is better?? If your coding skills good and if you know JAVA, Rest-Assured is good. If you want to use a tool and use groovy, then SOAP-UI. Thanks ,Can we do both web service and API testing using rest assured ,As far I know using Soap UI we can test both. Hi I think your approach will be bit difficult to maintain if my response json will be huge we have to write json path to extract the JSON. Instead why don’t we go for model class mapping way(pojo class) map your response with model class from that we can extract the data. If I have to use Groovy scripting along with selenium for REST APIs, how do I approach? Hello Manjula, in Baeldung there is an article for this: https://www.baeldung.com/rest-assured-groovy I hope it helps. could you please tell what’s wrong? Hello, The example API is old. You should get the fundamental from the article and try to implement it for your own API. Best Regards. Hi Onur, Thank you for your tutorial, I am starting to learn API testing but there are many tools and I don’t know how to start manual, then automated?! I saw many tutorials but, you know, none of them start similar to you from zero points, could you please let me know if you know any good resource? my colleague recommended starting with the postman, what is your idea? Yes you can use POSTMAN to check the endpoints and their functionality. After that check the responses in JSON viewer websites online. After that, you can start to automate them even using POSTMAN or writing a JAVA project with Rest-Assured or Rest Template or OKhttp or similar libraries. I suggest Rest-Assured because it is very QA friendly. I hope this helps.